If you are looking for a set all-season, all-terrain radial tires for your truck, Goodyear Wrangler Radial and Cooper Discoverer A/T3 are indeed good and viable choices. Both of these two models are quite popular on the market. Goodyear Wrangler Radial is praised for the superior grip and traction on various surfaces. It allows confident driving in almost any weather and road condition. 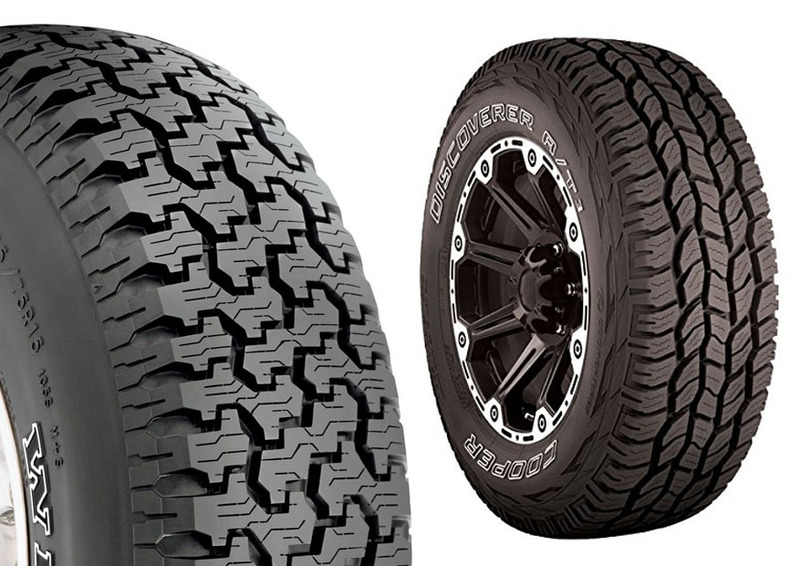 On the other hand, Cooper Discoverer A/T3 comes with a modern and aggressive tread design for uncompromising performance, quietness, and comfort. Continue reading below for more details about Goodyear Wrangler vs Cooper Discoverer! What is a Radial Tire? Both Goodyear Wrangler Radial and Cooper Discoverer A/T3 are radial tires. The first tires on the market were bias-ply tires, but radial tires have become much more popular since 1968. A radial tire is a vehicular tire design which has the cord plies arranged at a 90-degree angle to the travel direction. Such design creates a radial pattern if seen from the center of the tire, hence the name. There are several advantages that radial tires have over bias-ply tires. First of all, radial tires can reduce the fuel consumption due to the lower rolling resistance. Radial tires also have a wider footprint, which creates more footing area for better stability. Furthermore, the sidewalls are more flexible, which in turn can deliver a softer ride. Radial tires are generally more durable and able to last for a longer time. First of all, let’s get to know the available sizes of Goodyear Wrangler vs Cooper Discoverer. You need to know that Goodyear Wrangler Radial is only available in one size, which is P235/75R15. It has the S speed rating, which means that it is suitable for speeds up to 112 mph. It features outlined letters on the sidewall. Combined with the aggressive design, it looks cool and stylish. It is suitable for a rim diameter of 15” and rim widths of 6.0” – 8.0”. For the Kevlar version, see Goodyear Wrangler vs BF Goodrich. On the other hand, Cooper Discoverer A/T3 is available in many sizes. There are many different varieties with different width, diameter, load range, and sidewall. There are tires for rim diameters of 15” – 20” with D, D, or E load range. The tire is M+S rated, which means that it has been tested and verified to be safe for usage on mud and snow. Now, let’s compare the construction of Goodyear Wrangler vs Cooper Discoverer. Unfortunately, Goodyear Wrangler Radial has limited information available regarding its construction. The manufacturer doesn’t specifically mention the tread compound, but it feels solid and durable. On this tire, you can find an aggressive tread pattern whose lugs may appear like jigsaw puzzles. The manufacturer claims that the tread pattern has been optimized to provide grip and traction in all conditions, and the large tread blocks help to create a stable footprint and solid handling. The side lugs are quite thick, and there are lots of paths for water evacuation. On the other hand, Cooper Discoverer A/T3 is confident with its silica-based tread compound which creates excellent traction and handling on wet roads and also improved resistance to cuts and chips on harsh rocky terrains. The modern, aggressive tread pattern features five all-terrain ribs for uncompromising performance in both on-road and off-road applications. It features a broken center rib for enhanced soft surface traction and handling, lateral groove protectors for increased resistance to stone retention and stone drilling, and dual tread element walls for enhanced ruggedness and durability. In general, Goodyear Wrangler Radial is an impressive all-round tire. It is usable in all months of the year. It rolls smoothly on dry roads, with very good traction for confident handling and braking. But it is not only great on dry roads. It is also great on wet roads. The tread elements bite very well onto the road, and the deep sipes and design make it quite resistant to hydroplaning. It evacuates water out effectively and efficiently. The snow performance is also good. The tire is actually quite rugged and durable. It does not wear off easily. Unfortunately, there are some minor concerns regarding the road noise. While the tire rolls smoothly, the road noise is quite noticeable. After all, all-terrain tires usually develop noise issues after some time. Cooper Discoverer A/T3 is also an impressive all-season and all-terrain tire. It is smooth and quiet. The grip and traction on dry roads are great. It is also highly resistant to hydroplaning. The curved and deep sipes are highly efficient in evacuating water and debris. Furthermore, it lives up to the rating; it has excellent performance on mud and snow. Well, it is indeed not powerful enough for deep mud, but it can handle light mud and snow without a problem. But the most noticeable difference in the comparison to Goodyear Wrangler Radial is the quiet performance. Cooper Discoverer A/T3 is significantly quieter. If you often get annoyed by road noise, you should consider getting this tire. Finally, you should also consider the warranties provided by Goodyear Wrangler vs Cooper Discoverer. Unfortunately, Goodyear Wrangler Radial does not have any tread life warranty. You may get a warranty from the seller or distributor, but the manufacturer does not provide any warranty. Well, the tire is rugged and durable, and people rarely have a problem with it. But going without a warranty is quite a risky move. On the other hand, Cooper Discoverer A/T3 comes with the 90,000-km Treadwear Protection. This is a very good warranty. It can protect you from potential manufacturing or material defects. In the end, between these two tires, Cooper Discoverer is much more recommended. It has a better design which allows quieter performance. The traction is great on dry and wet roads as well as in snow and mud. Furthermore, it is protected by a 90,000-km warranty. On the other hand, Goodyear Wrangler Radial actually has good performance, but this tire can’t beat Cooper Discoverer A/T3 because of the road noise and the lack of a good warranty.